During Semi Truck and Roadster reveal, 60 seconds was devoted to a Pickup concept, but which image was the real concept? Large truck in image would be too wide (illegal) to drive on US roadways, indicating the real concept was the generic looking truck in back. Pickup truck market is ~$100B. A large "frunk" for tools etc., would be a sales advantage for Tesla that other pickup makers cannot offer. 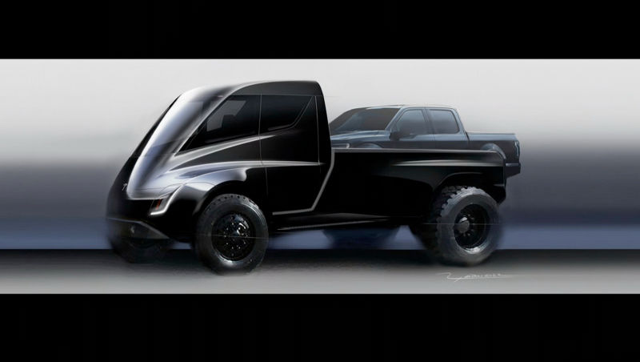 Musk showed the image below and stated that it would be a pickup truck that could carry a pickup truck in its back cargo bed. But was he being serious, or teasing us? Every author I've read thinks he was making a joke. This question is actually important because the Ford F series of pickup trucks are the largest selling vehicle of any kind in the world. According to Wahlman's Seeking Alpha article, the total pickup truck sales in 2016 were around 2.7 million units. Not trying to be terribly accurate, if I just assume $35,000 as the average price then the pickup truck market size would be around $100 Billion in 2016. No EV pickup truck offered for sale to date has a range that would make anyone wanting a real pickup truck feel comfortable. The new 200kWh battery pack or better, two of them for 400kWh onboard battery capacity would, in contrast, meet most people's needs. This is obviously just an image created in Photoshop or the like. The positioning of the truck in back obscures the headlight conveniently right where the Tesla signature horizontal LED line would reside. The rear wheel would be resting on the tail gate, an impossible situation. The pickup in back, matches the Semi Truck reveal last April....it is obscured and provides just a hint of what is go come. This single fact, in my opinion, proves that the "scaled down version of the semi" idea for a pickup was a joke. That joke obfuscated the real reveal of a perfectly normal pickup truck I believe Tesla is actively developing. For a large commercial vehicle like UPS vans or the Semi Truck, the maximum width is only 6 inches wider at 8 feet 6 inches. In other words, classifying the supposed pickup as a commercial vehicle wouldn't work either. The front of the fuzzy pickup looks like any other pickup out on the road today. That would be a smart aesthetic choice for Tesla to make. People have come to accept and like the shape pickup trucks have. So if Tesla sticks to what sells, that's what Tesla would develop. Pickup trucks aren't aerodynamic or streamlined for high speed long distance freeway travel like a Model S or 3. Instead, they are rugged, cargo carriers designed to get the job done, whatever the job happens to be. They may drive on freeways, but hauling large or heavy things is what they are built and purchased for. A large Frunk would enable a Tesla pickup to provide value no other pickup truck maker can. Where there is normally an engine, Tesla could provide locked tool and "stuff" storage. Pickup trucks consume more energy than automobiles. So the 100kWh battery pack of a Model S or X won't be enough stored energy for a pickup. Elon didn't mention the size of the battery pack the Semi would use. But I calculated from aerodynamic and rolling friction first principles that it would require an 800kWh battery. Then by carefully watching the reveal event video again, it's clear that the semi has 4 battery packs, one for each of the 4 drive motors. Apparently, the Semi Truck uses 4 battery packs as can be seen above, each at 200kWh size, and each motor has it's own independent battery (energy) supply. A pickup truck could yield excellent range for various applications if it had 1 or 2 of those 200kWh battery packs. And by installing 2 packs the Tesla pickup could power the front and rear wheels from independent motors, much like the Semi truck, guaranteeing it won't break down out on the job. This article originally appeared at: https://seekingalpha.com/article/4133753-tesla-pickup-truck-100b-market-space.